This is something you’re going to hear a lot over the course of your Ruby journey: “NORMALIZE YOUR DATA”. But what does this mean? Between humans, the concept of “normal” is typically (and overly-simplistically) understood to connote, “not weird”. As in, if you’re normal, then by default you are not a total weirdo (/ˈwi(ə)rdō/ 1. A person regarded as being very strange or eccentric 2. A deranged, potentially dangerous person. I suppose, however, that derangement and danger are not limited to just people). In Ruby, on the other hand, “normal” — or rather, “normalized” — carries a very different meaning. The latter is mostly used to describe data (i.e strings, numbers, etc.) that has been transformed and accounted for in such a way that it is now easier to compare it against other data. It’s kind of like assuring that nothing will be “lost in translation”. In fact, it’d be a little like having a handy translator on hand (ha! no pun inten…) that can translate — in real time — whatever you’re saying out loud in English to another language. And this might save your @$$ when you’re trying to communicate to a room full of non-English speakers. IN FACT, when we humans translate stuff, we are, essentially, NORMALIZING it! Actually, I just thought of the best analogy of all: it’s making things “apples to apples”. We couldn’t run around comparing apples to oranges now, could we?! Why that last piece of advice? Because every user on the planet can’t be trusted to input his or her data accurately, every time. So ‘normalizing’ this input by calling .downcase on it ensures that you’ve accounted for any capitalization inconsistencies. 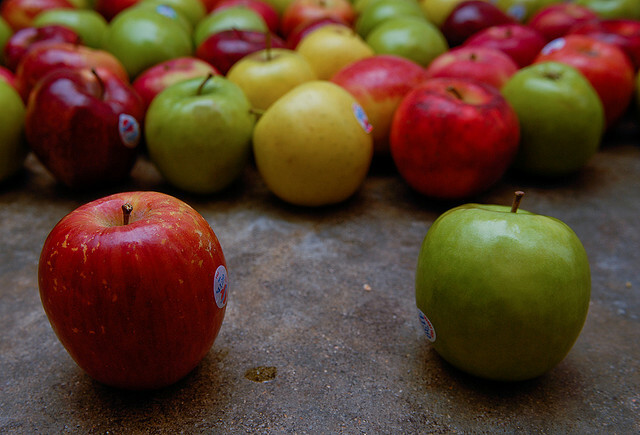 You can now better compare apples to apples.